OBJECTIVE: The role of laparoscopy in small bowel obstruction remains controversial and it has been rarely reported in the treatment of acute obstruction secondary to Meckel’s diverticulum. Chronic intussusception can have variable symptoms and diagnosis is challenging. We present a case of chronic small bowel intussusception in an adult man secondary to Meckel’s diverticulum that was treated laparoscopically. METHODS: A case report and review of the literature is presented concerning laparoscopic treatment of chronic intussusception and of Meckel’s diverticulum in the adult. RESULTS: A 53 year old man complained of intermittent abdominal pain and after endoscopic evaluation was found on CT scan to have small bowel intussusception without acute obstruction. A repeat CT scan indicated similar findings. Diagnostic laparoscopy revealed the intussusception and small bowel resection with anastomosis was performed. Pathologic review confirmed chronic intussusception due to Meckel’s diverticulum. CONCLUSIONS: Previous case series and reports have indicated that laparoscopy is safe and effective for the evaluation and treatment of symptomatic Meckel’s diverticulum. 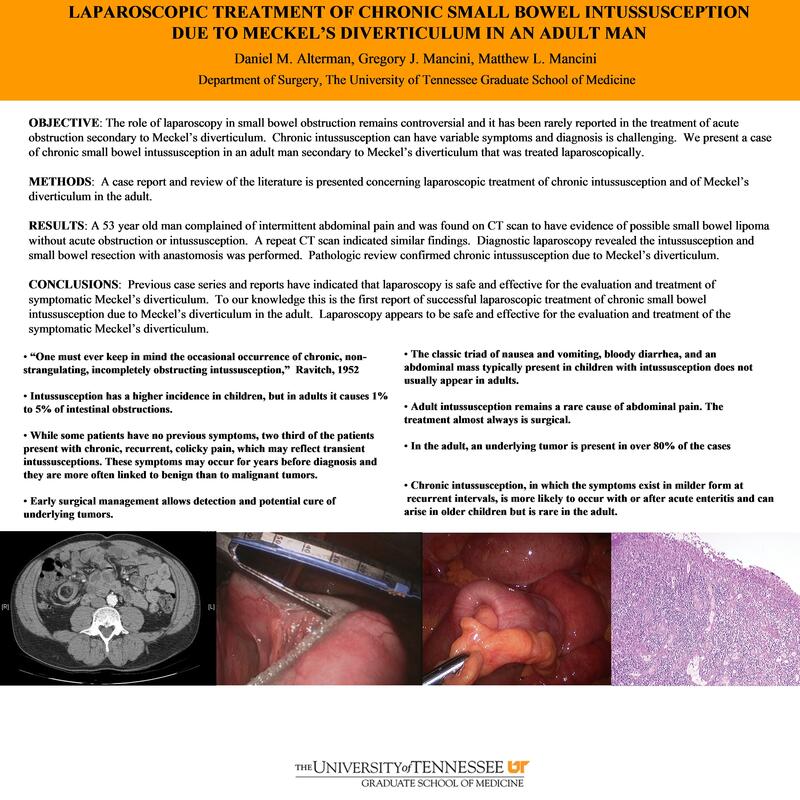 To our knowledge this is the first report of successful laparoscopic treatment of chronic small bowel intussusception due to Meckel’s diverticulum in the adult. Laparoscopy appears to be safe and effective for the evaluation and treatment of the symptomatic Meckel’s diverticulum.